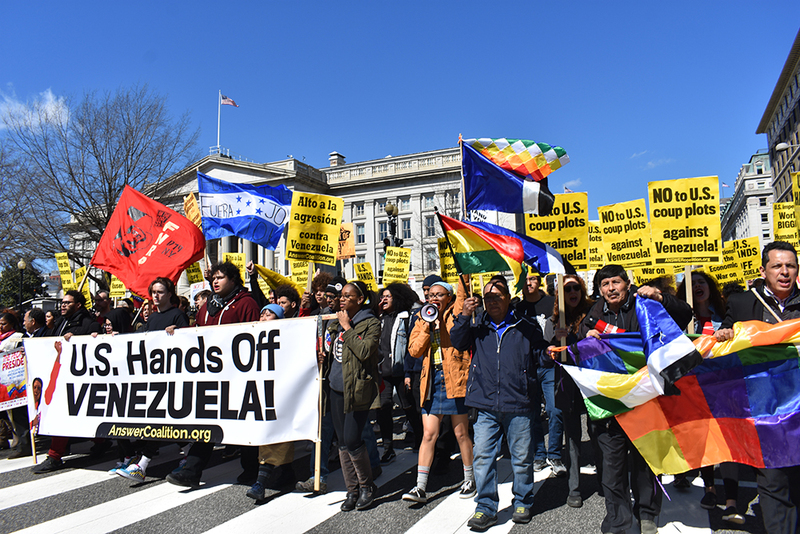 The largest demonstration to date in opposition to President Donald Trump’s planned coup in Venezuela took place in Washington D.C. on March 16. Demonstrators from all over the country filled the streets of the capital with banners and signs that condemned economic sanctions as a form of war against the people of Venezuela. The demonstration, initiated by the ANSWER Coalition (Act Now to Stop War and End Racism) and endorsed by scores of progressive organizations and hundreds of grassroots leaders, was addressed by some of the most well recognized anti-war leaders in the United States, including legendary whistleblower Daniel Ellsberg who released the Pentagon Papers in 1979, peace activist Cindy Sheehan, Jill Stein the Green Party 2016 Presidential candidate and others. Journalist and Consortium News editor Joe Lauria said that people need to support whistleblowers like Chelsea Manning and WikiLeaks founder Julian Assange, who are being persecuted by the U.S. state for exposing its war crimes and conspiracies. Liberation News spoke with Jules Orkin from a New Jersey chapter of Veterans for Peace, who said the U.S. has been “doing the same thing for years,” saying that everybody had a responsibility to “do something to stop this” attempt at regime change. The organization recently issued a statement calling on all members of the U.S. armed forces to refuse any orders given to intervene in Venezuela. The rally preceded a march through the streets of Washington, snaking it way past the White House, down Pennsylvania Avenue and up through the bustling Chinatown district, where shoppers and tourists joined the thousands of protesters in saying “Hands off Venezuela!” once they heard the truth about the U.S. coup and the U.S. government’s phony claims to care about human rights, especially when it stands idly by while the world’s greatest humanitarian crisis unfolds in Yemen at the hands of U.S. allies Saudi Arabia and the United Arab Emirates. Following the march, protesters grouped together for a teach-in at a local church, where they pledged themselves to carry the anti-imperialist struggle back to their communities and build a powerful movement against U.S. intervention and regime change. At the teach-in, several speakers joined via Skype, including former Green Party presidential candidate Jill Stein, who noted that U.S. imperialist wars aren’t just a catastrophe abroad, they’re a disaster at home, too, where the U.S. military budget dominates state spending to the detriment of basic social programs, welfare and environmental protections, as well as depriving workers of their hard-earned money, of which they have less and less every year. Whistleblower Daniel Ellsberg, who in the 1970s showed the world how the U.S. government lied about its imperialist motives in the Vietnam War, said that it would take more than simply raising our voices against U.S. regime change wars and interventions to stop them, noting the impact that direct action and concerted long-term resistance has had in the past. “The best way that we can help the Bolivarian Revolution in Venezuela is to effect a brand new American revolution right here at home. That is our job, that is our mission, we have a duty to win,” she said.